Stakeholders came together to hold a celebratory completion ceremony for a £1.2 million development in the centre of Gainsborough. The Cross Street scheme is the first in the district to have successfully achieved one of highest energy efficiency ratings possible: Code for Sustainable Homes Level 5. You can see how this was achieved by watching the video case study on YouTube. The Cross Street project stakeholders include L&H Homes, Longhurst Group, West Lindsey District Council, developers Robert Woodhead Limited, Allan Joyce Architects and Richard Julian Associates. 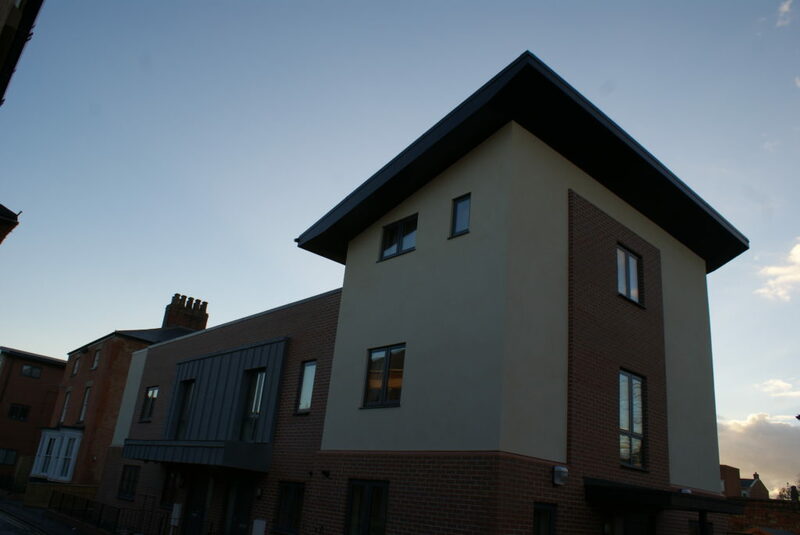 Situated on Cross Street, the former West Lindsey District Council car park has been converted into four new affordable rental properties managed by L&H Homes. In a bid to significantly reduce tenants’ energy and water bills the homes feature high levels of thermal insulation, solar panels and rain water harvesting. A former Georgian building, adjacent to the new build properties has also been converted into two residential flats and a three bedroom house. The scheme was partly funded by West Lindsey District Council’s Eco Town project. Mother of four Lynne Schofield moved into one of the properties four months ago. Her family is really happy with the move as they live near the centre of town, have a very warm house and a large garden. She said: “The house warms ups very quickly, particularly for an old house. The triple glazing makes it nice and quiet inside. Chairman of West Lindsey District Council Cllr Jessie Milne cut the ribbon at the opening. She said: “I am really impressed with the properties and what has been achieved here.